The CTS-V represented Cadillac's first true offering in the sports sedan market, and GM was shooting to compete with the likes of the BMW M3 and Audi S4. What it may lack in refinement or chassis development compared to those cars, it makes up for in unadulterated hooliganism and Pure American Awesome. The formidable 400hp 6.0L LS2 lives under the hood of this '06 model (replacing the earlier 5.7L Gen III LS6), and it wears respectable 245/45R18 tires paired with massive 355mm brakes. These days a first-gen CTS-V is the working man's super saloon and used prices are hanging close to new Chevy Cruze base MSRPs. The featured car has quite a few drivetrain upgrades and reportedly makes 400 hp at the rear wheels, which is likely about 475 hp at the flywheel accounting for driveline losses. 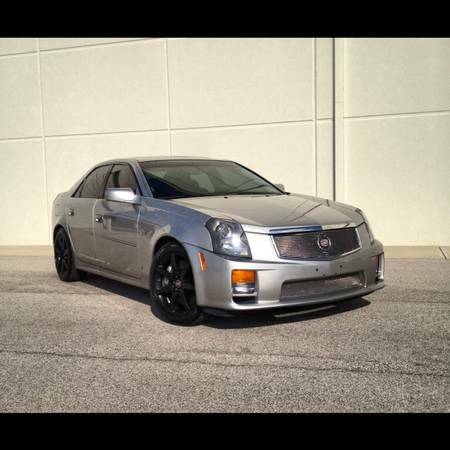 Find this 2006 Cadillac CTS-V here on craigslist in Brownsburg, Indiana for $16,995. Tip from Jalopnik commenter bandit. ~ not sure i am remembering correctly but i thought i was once told this was the first Cadillac to offer a manual transmission since shortly after WW2. Don't forget the Cimarron! Wait, on second thought, even if it had a stick, forget it. Cimarron- a reminder to every engineer at Cadillac of what can happen when the bean counters are allowed to make decisions. Did the Zig-Zagginwagen (Opel) Catera have a manual option?